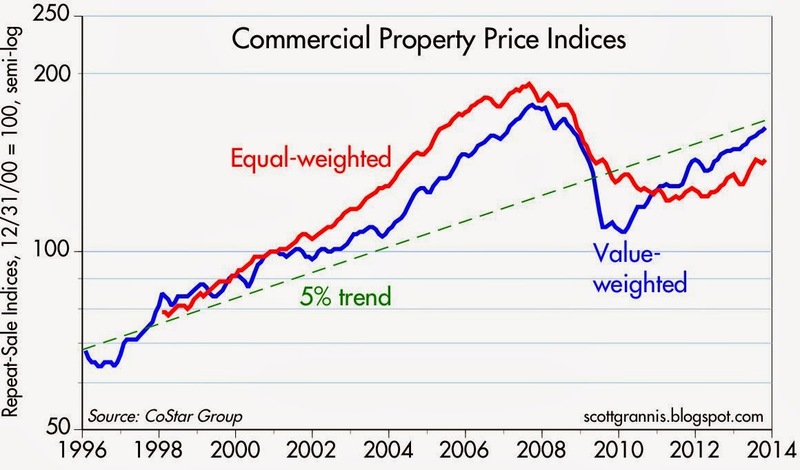 According to the CoStar indices of commercial real estate prices, the sector has been quite strong this past year: prices are up between 7 and 10% for the 12 months ending October. 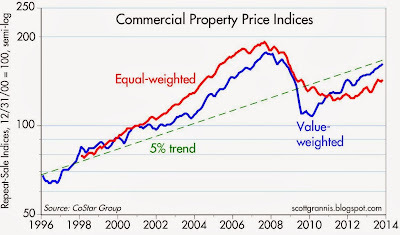 As the chart above suggests, there is still a lot of interesting upside potential in commercial real estate. I always found the post-2008 dump in commercial real estate values to be thought-provoking. It almost exactly mirrors the residential dump---yet buyers and financiers of commercial real estate are often and usually sophisticated institutions. These are not wahoo-homebuyers getting liar loans. Yet the results are nearly the same. This leads me to conclude that the reason for the property dump was not Fannie and Freddie and CRA or whatnot, all of which should be dispensed with. The big driver of the dump was a sudden plunge in microeconomic aggregate demand, likely instigated by Fed tightening in 2008, reacting to inflation ghosts. Remember the gold and oil scare was going on, also the corn ethanol run-up. The Fed reacted to these false signals. I am happy to see the commercial real estate recovery, and hope it has a lot of legs. Earlier this year we pointed out that, with the U.S. and other major Western economies experiencing slower growth in the last five years than Japan in its lost decades, long-term trend growth had already downshifted around the world, resulting in weaker recoveries and more frequent recessions than most had expected when the 21st century began. Following Japan’s lost-decades example, the policy response has been more and more quantitative easing, which has been unable to break this pattern. Rather, in the U.S. and the Eurozone, the central banks are increasingly failing to meet critical inflation target mandates. In reality, these major economies are already like Japan in its lost decades, recalling the economic truism that recession kills inflation. The European Central Bank cut rates last month following a "surprise" drop in Harmonized CPI inflation to 0.7% in October. But a head-to-head comparison on the same metric (see chart) shows that U.S. inflation was actually lower, having dropped to just 0.6% in October. What many still fail to acknowledge is that the major Western economies – including the U.S. – are effectively becoming Japan: the comfortable consensus is that, in contrast to the Eurozone, inflation in the U.S. should be (to quote the Fed) “moving back toward its longer-run objective” of 2%, and thus not a concern. But should it be a concern, with yoy growth in the Personal Consumption Expenditures deflator falling to a four-year low of 0.7%. Ominously, ECRI’s Future Inflation Gauges remain in cyclical downturns in both the U.S. and the Eurozone. In the coming months, inflation is likely to fall further below their official targets in both economies. The Bull / Bear Ration reached 4.07 December 11th. According to CNBC, this preocuppied Tweeter feeds on Wall Steet Thurday afternoon. It never did and in fact, two well known real estate management companies gave their shareholders monster returns..
Re: the fear of deflation. I think this fear is unduly exaggerated, and the parallel to Japan is not valid. Japan had a little bit of deflation accompanied by a currency that rose inexorably for decades against every other currency on the planet. If anything crippled Japan's economy, it was the yen, not deflation. The dollar, in contrast, is still close to its weakest level in history against other currencies. "Investors are buying new U.S. corporate bonds at a record pace, and demanding the smallest interest-rate premium to comparable government bonds since 2007." Mr Grannis, why would a strong currency be a liability for Japan? A very strong Euro had little or no impact on Germany, also a major exporter. Thanks for nice sharing. you can also find best place to set up your office in IT Park is getting easy in Wardha IT Park. The main object of Wardha IT Park is to provide best quality and cost effective space to the companies. For fruther Information about Best IT Park in India Visit us Today!! Hi...thanks for sharing a enthusiastic article.It help to allReal Estate real estate egents.And here is more information about real estate market in Kansas city.So keep posting. Especially into multifamily dwellings, apartment buildings and condominium developments. Property development and real estate investing is the best way to secure your financial future.